The Parrot Finch (genus: Erythrura) are small, very colorful finches that occur naturally from South-east Asia to New Guinea, northern Australia and numerous Pacific Islands. Within their natural range, they inhabit forests, bamboo thickets and grassland areas. Some have adapted well to urban living and are found on cultivated farmland, in parks and gardens. 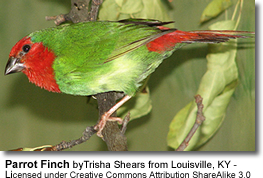 Several species are commonly available in aviculture, while others are at risk of extinction because of habitat loss and degradation, namely the Green-faced, Royal and Pink-billed Parrotfinches. They have become very popular aviary birds, and some beautiful mutations have been bred and are readily available. They are a true delight to have in a mixed aviary or as a colony breeder. They have a natural inquisitive nature, and seem to have the happy knack of recognizing the breeder immediately and greeting them at the aviary door. This breed is totally vivacious, very energetic, and always on the move. They are very gentle, which makes them an ideal choice, for a mixed aviary. This finch loves water -- they enjoy jumping in and out of it. Bathing will take place a couple of times a day, summer or winter - and are an important part of their daily grooming. 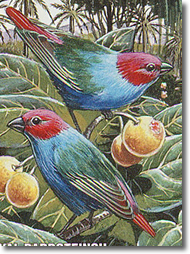 Another characteristic of the parrotfinches is their almost semi-nocturnal nature. They are always last to roost at night, and can be seen still on the food station, or darting around the aviary when you have the house lights on. Conversely, they are first to stir in the morning. It is always advisable to have more hens in your colony than male birds, as it minimizes the potential conflict between males. The average length of this finch is 12.5 cm / 5 in. This species is "mono-morphic." In other words: both sexes look the same in most sub-species. Experienced breeders will be able to differentiate between the sexes by observation. With some sub-species, females have a duller plumage and slight color / size differences compared to the male. The plumage color of most of the sub-species is mostly green. The head, brow and a predominant part of the chest area, is a beautiful crimson scarlet or -- if it is a blue-headed parrot finch -- blue. This scarlet or blue area is also carried to rump area of the bird. But instead of being the vivid crimson, tends to be more of a vermilion color. Fledgling birds tend to be of a dull olive color. In the nest the youngsters have the most startling iridescent blue "gape" (corners of beak). No doubt, there to help parent birds locate the gaping mouths of chicks, when entering the darkened nest, from the natural light of the aviary. They are ideally suited for large well-planted aviaries, with plenty of flight space. 8ft. long x 7ft. wide, for example. Give or take a couple of feet. An aviary can never be too big for these active finches. Provision should be made at the outset to be able to install slotted tracking on the front of the aviary, to slide in either Perspex or Polycarb sheets during the winter months, to keep out the winds, and help keep some heat in. In talking to some breeders, in the earlier days, cooler climate breeders were plagued with the same problems with the parrot finches, as that faced by gouldian breeders. Having said all that, give them food, water, and nesting material, and they are likely to thrive and breed. If within your aviary, you have the facility to grow a seeding grass, then you are guaranteeing yourself a happy flock of parrot finches. They have a very friendly and inquisitive personality, and grow quite confiding with their caretakers, greeting them enthusiastically at the aviary door as they come in to tend to the flock. 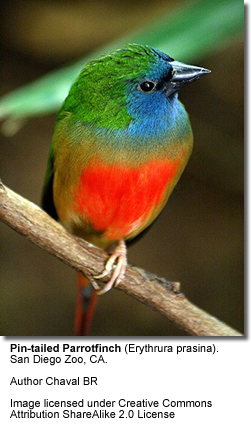 Another characteristic of the parrotfinches is their almost semi-nocturnal nature. They are always last to roost at night, and can be seen still on the food station or darting around the aviary when it is getting dark. They are also the first to stir in the morning. Captive parrotfinches readily accept a wide range of nesting accommodations, from a standard "gouldian" or "budgerigar" nesting box, to a wicker or cane elongated tube. The nest box should be situated as high in the aviary as possible, although they are willing to settle for a nest box at lower levels. The hen seems to be the predominant nest builder. Her preferred nesting material includes well-dried pampas grass, soft well-dried grass or teased strands of hessian, cut to manageable lengths. The hen usually lays between two and six eggs. Fertility rates may be influenced by diet climatic conditions or the individual pair. Both parents share the incubation duties with great dedication. Incubation takes about thirteen to fourteen days. Parrot Finches are usually tolerant to nest inspection. Should you find a chick or chicks with a skin color that is darker than you would normally expect, this may be indicative of dehydration. One cause could be lack of green food or live food, such as mealworms or maggots. Lack of bathing opportunities may also create such problems. The young usually fledge at 21 days. It is within this first week that the fledgling commences to take on the distinctive color of the breed. These finches tend to be excellent parents - however, it is characteristic of this breed that parents may set up a new nest, and be sitting on a new brood prior to the fledging of the last. Marker rings should be put on the fledglings when they are about 4 weeks old. Marker rings are an important tool for keeping track of them and for record keeping purposes. 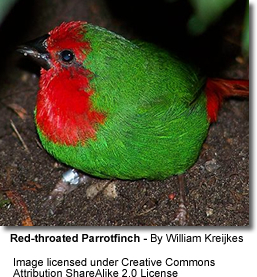 I owned a lovely family of red-faced parrot finches for several years and remember these little birds very fondly. It was very endearing to see how family-oriented they were. At one time, as I was carrying soapy water into the aviary for cleaning purposes, one parrot finch managed to fly out of the door. All day long, he flew around the aviary, and I was very sad knowing that this beautiful (and colorful) little bird would be easy pray out here, and would not make it for long. In the evening, I went back to the aviary and was surprised to see that the little parrot finch was back in the aviary, except he was in the section where the cockatiels were. As I was wondering how this was possible, and as I was checking the aviary for any possible means he could have gotten in, I found that I had forgotten to close up the run-off hole (where the cleaning water runs out), which was basically an about 1 inch tube that led to the outside. The little finch clearly has "crawled itself" back into the aviary, to join his family. And that he did ..
My assessment of them: Beautiful and personable little birds. They don't breed as prolifically as say the zebras or the societies, but that aspect was never as important to me as their great little personalities. They also make very good parents. They are not as widely available as other finches, but if you can get them, I would really recommend them for your aviary. They are beautiful, peaceful, quiet and very endearing birds. In my area, both blue-face and red-face varieties were available. Even though the red-face parrotfinches may be more striking -- their personalities should be the same. A good-quality seed mix should be provided, as well as soaked / sprouted seeds, seeding grasses, various greens and live food - especially during the breeding season. They readily accept fresh fruits / veggies a lot, and greens such as parsley and dandelions. You can get a lot of free "green stuff" (safe, untreated plants please!) from your own garden to feed to them with.